Mr. Angel Gurría, Secretary-General of the OECD, was in Bratislava on 19 June 2015 to attend the 10th GLOBSEC Bratislava Global Security Forum. He participated in the panel discussion on “Dynamic Visegrád: Energy, Growth, Competitiveness”, alongside the Prime Ministers of “Visegrád 4”: Ms. Ewa Kopacz, Prime Minister of the Republic of Poland; Mr. Robert Fico, Prime Minister of the Slovak Republic; Mr. Viktor Orbán, Prime Minister of Hungary; and Mr. Bohuslav Sobotka, Prime Minister of the Czech Republic. While in Bratislava, the Secretary-General held a bilateral meeting with Mr. Peter Kažimír, Deputy Prime Minister and Minister of Finance of the Slovak Republic. 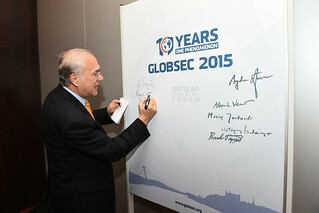 19 June 2015 - OECD Secretary-General Angel Gurría at the 10th GLOBSEC Bratislava Global Security Forum.